In the last week of March, the S&P 500 Index moved more than 2% for three consecutive days – the first time that's happened in two and a half years. Meanwhile, the CBOE Volatility Index (or "VIX"), known as Wall Street's "fear gauge," has traded at an average of nearly 18 this year – around a 60% increase over last year's average of 11… and a big jump that reflects a lot more uncertainty in the market. So let's start with a question: What is the most important determinant of your lifetime success as an investor? It doesn't have much to do with the usual things people talk about. It's not about being in the right funds or the right asset classes. It's not even about being in the right stocks. Let's say you owned shares of consumer-electronics titan Apple (AAPL) 10 years ago. If you put $10,000 in Apple back then, you'd have about $94,000 today. That's almost a 10-bagger. You didn't have to worry about Fed moves, the economy, the dollar, etc. You just had to own Apple... and go fishing. But it wouldn't have done you much good to buy Apple in January 2008 for $25... only to get scared out for a 25% loss in March 2008. You had to hold on. Even if you did hold on, you would've looked like a dummy by March 2009. At that point, with the stock at $12 per share, you'd be sitting on a 52% loss. Even if you held it and doubled your money in 2011 when the stock hit $50 per share, selling would have been a huge mistake. So even if you happened to own one of the best-performing stocks of the past decade, you can see all the ways you could've screwed it up. You can also see how this applies no matter what you invest in. Even if you have your money in a boring old index fund, it doesn't mean you're immune to making the same mistakes. You could panic and sell near a bottom, or stop investing because the market has done poorly and buy back in near a top. Well, if investing were easy, everyone would be rich. Nick Murray, a retired investment advisor who started out in 1967, is also the author of a couple of wise books on investing. Murray preaches the idea that success has more to do with how you behave than which funds or stocks you own. Success is more about sticking to a plan and focusing on principles that work. 1. We can't know exactly how things will turn out all right... We just know that they will turn out all right. Murray likes to say that you can't be a good investor if you're afraid of the future. You have to believe that if you follow time-tested principles, you'll be OK. In our high-end equity research service, we aim to buy undervalued stocks that have strong financial conditions and are managed by people with skin in the game. It doesn't mean every stock pick works. And we don't know when they'll work. But we believe that if we follow our principles, our portfolio will do much better than our neighbors' over time. 2. Stop looking at your portfolio every day. This is simple, but plenty of research shows that the more people look at their portfolios, the worse their returns. This is probably because it makes them more likely to ditch something that has performed poorly or jump on something that looks like it's moving. If you look at your stocks several times a day, first, try to look only once a day – after the close. Then try to make it once a week. See how this shifts your outlook on price changes. 3. Never own so much of any one thing that it could kill you if it goes south. I remember years ago, one reader sent me his portfolio. I cringed. It was full of gold-mining stocks – way too much in "one thing." As Murray memorably puts it: "The fewer ideas in your portfolio, the fewer bullets it will take to kill you. One idea: one bullet." 4. Invest for total return, not yield. I see some investors – particularly older investors – focus on stocks that pay generous dividends. This is a mistake. The focus should be on total return (capital gains plus dividends), not yield (dividends only). Murray says that a focus on dividends is like having a well, but only drawing out water that comes from snowfall and not rainwater. "Rainfall, snowfall: It's all water," he writes. "As long as you draw less water than what's coming in, you'll be fine." In short, if you're doing the right things, you have no reason to fear volatility, or even a bear market. Just sit tight and stick to your plan. "Don't expect to see another long stretch with such low volatility anytime soon," Ben Morris says. Learn how to navigate this market environment – and stay long stocks – right here: The Return of Volatility. "To make plenty of money in stocks, you must behave better than the vast herd of investors," Dan Ferris writes. Most investors never develop this insight... Read more here: The Only Advantage You'll Ever Get in the Financial Markets. Back in September, we showed you a popular fitness company making a strong comeback. Its turnaround makes sense... A recent study showed that for the first time, more than half of Americans are getting the recommended amount of exercise per week. And the U.S. fitness industry is growing, too... It topped a record $27 billion in 2016. 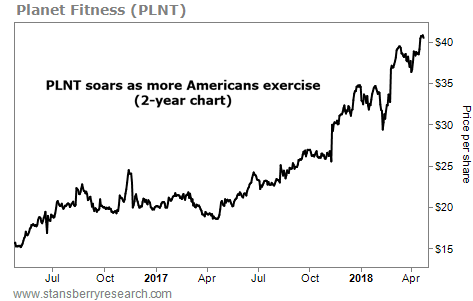 Today, we'll revisit the company riding this boom... We're talking about Planet Fitness (PLNT). It's one of the largest franchisors and operators of fitness centers in the U.S., with nearly 11 million members and more than 1,500 locations. The big workout trend is good news for Planet Fitness... Last year, the company brought in 1.7 million new memberships, and its same store sales increased more than 10%.